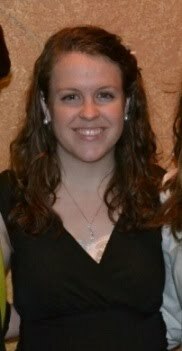 When Katie asked if I wanted to be part of the Winterkist blog hop I said yes in about 0.2 seconds. And then in about 0.5 seconds I knew what I was going to make. Even though I knew what I was going to make, I wanted to ensure that anything with Winterkist was made in the epically fun spirit of its designer. So I thought to myself: WWMSSD? That's What Would Monica Solorio-Snow Do? for those of you who are behind the times :) Monica's a pretty fun and hilarious lady, so I tried to rise to her level - this is me channeling my inner Monica. By the end of the day, we were tired, but ready to get to work! A Winterkist advent calendar! When I was growing up we had a Christmas tree advent calendar and you hung an ornament up for every day. I loved doing that [still do] and so I really wanted to be able to physically move something for each day to countdown to Christmas. So to count down each day closer to Christmas you get to take a snowflake from the pocket [the snowflakes slide in more, I just wanted them to be seen for the picture] and snap it up around Prince William Gnoma. The snaps that are on the calendar itself are very hard to see since they're clear, so when none of the snowflakes are snapped on then it still looks great! I Steam-a-Seamed the largest gnoma in the collection to the background and then stitched in DMC Perle 8 around the edges. The only thing I'd do differently next time is layer some white fabric behind the gnoma so you can't see the background when it's stitched down. I kind of think it looks like freckles? 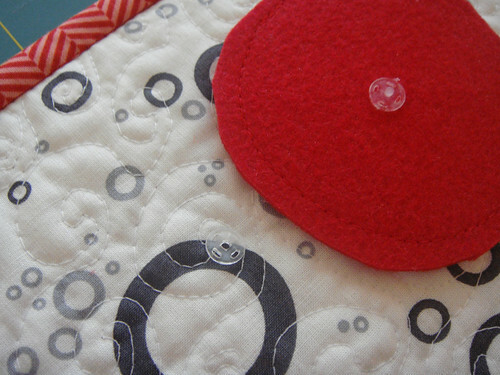 The snowflakes are interfaced and then stitched to some heavy duty red felt for durability. 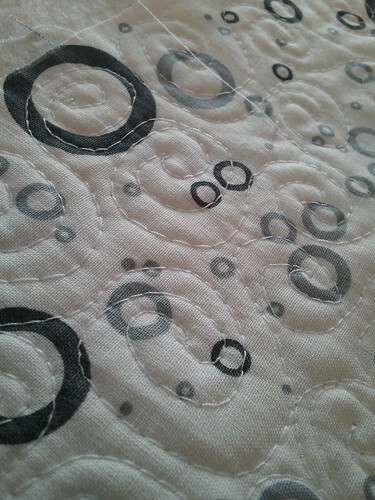 The white background [which is also Winterkist] is free-motion quilted in a new-to-me design. Swirls! Hopefully so it looks windy/snowy/blustery. I don't have the patience for practice, so this was my first try at this design, and I'm pretty darned pleased. Winterkist pairs up so nicely with this red Farm Fresh dot for the pockets, and the Riley Blake [I forget the line] for binding, and some fabric marker drawn numbers to indicate the day. In all honesty, I'd originally planned to embroider the numbers, but wanted nothing to do with more hand-work when I was sewing this all together. I love it! I love that it's on the bigger side [about 18" by almost 36"] so it will take a commanding space in my living room this winter. And I love that it's not "Christmassy" and so I can leave it up in January and February and June. The pockets are plenty big enough [3.5" square] to hold the snowflakes and even a little treat or note. I plan to sew some snaps onto some double fold binding or some ribbon so that I can use the snowflakes as a garland in January if I want. You could totally do that with the gnoma too, I just didn't think of it until I had already sewn him down. Thanks Katie for letting me join the fun, and for Monica for having gnoma fun with fabric! Don't forget that if you leave a comment on this post, or any other blog hop post this week, that you get entered to win a FQ bundle of your choice from The Fat Quarter Shop! Oh my gosh! That is totally sweet and awesome! I love this! This is absolutely the cutest advent calendar I have ever seen!! 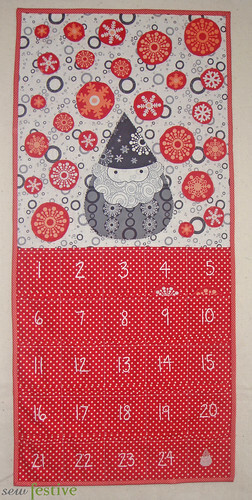 I LOVE advent calenders too and reallly want to make one. I love how you made this one, it's wonderful! Love, love, love it! Such a fun post. I love the little mustache photo. What a super idea. The advent calendar is so cool and all the little spots. Well done! Love the idea for the calendar and especially the roaming gnoma! What a super cute idea - thanks for sharing. Not only did you make a cute project but you wrote a cute story too. Woah snaps!!! Fantastic idea for attaching all the little pieces. Cheers! Love the Advent Calendar! Gotta get some Winterkist. 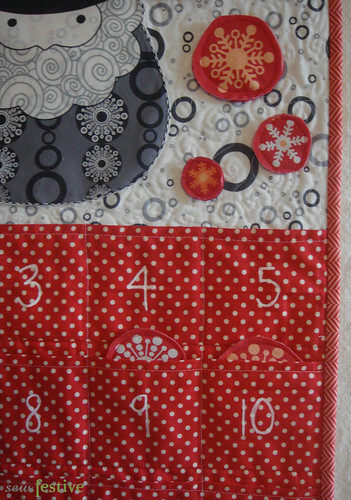 this is a cute way to make an advent calendar! love the snap on it! That's a very cute advent calendar. Clever to use clear snaps! Who had more fun, the gnoma or you? Wow! Such a fun project... I just love those gnomas!!! Thanks for sharing this project ! Freaking hilarious! I love mustache gnoma! This is just fabulous! What a wonderful idea and Prince William Gnoma looks great, freckles and all! Oh my gosh. This is so cute. I love Advent calendars. I'm sure Prince Harry will be thrilled!! VERY Cute !!!!! Love it!!!! Your advent project is cute - like the idea of the clear snaps. Love your ideas!!! Thanks for sharing in the blog hop - it has been great and I look forward to each day and each new and different project! Such a great idea. I love using the clear snaps, wouldn't have thought of that. I bet my nephews would love this! This is just the cutest project! I love how unique is it for an Advent Calendar. Any child, little or big, will love it! Oh what a cute idea! I really love this fabric. Thanks for a chance to win! Ah, I absolutely love this! So cute. And the snaps are a very creative idea. LOVE!! 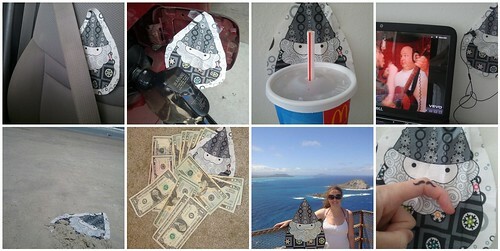 Especially the recap of Prince Harry Gnoma's day out! Fantastic! Wonderful Advent Calendar! The snaps are a great idea! What an adorable idea!! I love it and I bet my grandsons will too. Am so looking foward to this fabric coming out! Your swirls look wonderful. Such creativity. You go girl. I love your calender. Thanks for sharing. This is adorable. Much better than those candy calendars. OMG Prince William Gnoma is so awesome! Way better than the real deal! Another great idea! I love advent calendars and I think cute ones are hard to come by. Thank you for sharing this awesomeness. thoroughly enjoyed reading your post! 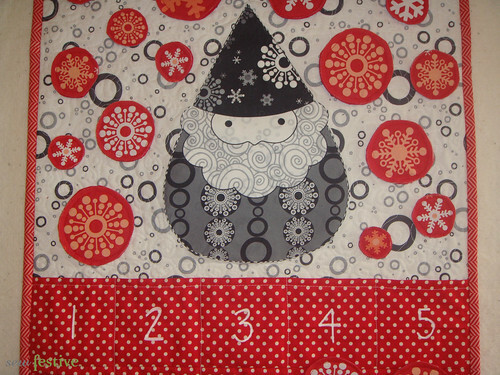 love your advent calender and fabric choices. winterkist is such a fabulous collection; it enhances your project beautifully. I wish there was a Gnoma big enough to hug on and take hiking. Of course, a red-headed Prince Harry Gnoma would be fabulous, too. So cute.... I loved the Gnome.. I love advent calendars! 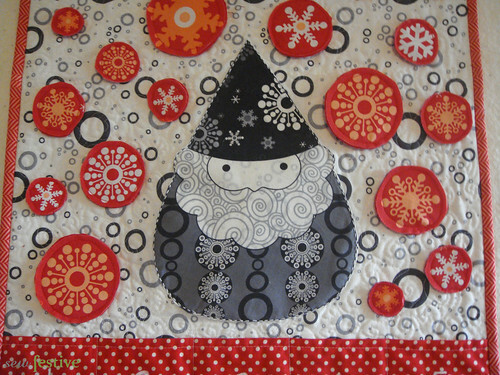 Fun use of your Winterkist fabric. Thanks for sharing. Great project! Love the use of clear snaps! This is a very imaginative project. I especially like the idea of sewing snaps on ribbon so you can display a garland of snowflakes in January (or whenever). I'm already thinking of ways to put my own spin on the project. TOO CUTE! I love Prince Harry Gnoma's Flat Stanley tour! ahhh, so cute. good idea with the snaps! awesome, this is such a great idea, Prince Harry Gnoma looks super-gorgeous. I LOVE the snowflakes-on-snaps idea too, it's so fun. Will bookmark this one to make - the advent calendars I made last year have teeny-tiny pockets, we need a bit more room for treats. And gnomas. Cat. Really cute idea. Much healthier than the chocolate advent calendars I get for my kids. Thanks! I love the adventures, it looks like you showed him a good time. Cute idea for the advent calender and the snaps idea is genius. Very nice idea. Those clear snaps are a great idea. Thanks. Love your red/grey color combo! Love your creativity and humor! Thanks for sharing. Haha! That was just awesome. I'd make that calendar in a heartbeat if I had a reason to. I have to follow your blog now. Have many fond memories of advent calendars when I was a girl, but none were as cute as this one. 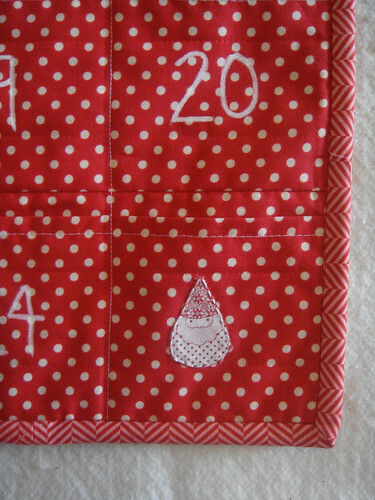 A gnome with freckles, love it. Oh I LOVE this idea! So much work though....want to do...so many other things to make. 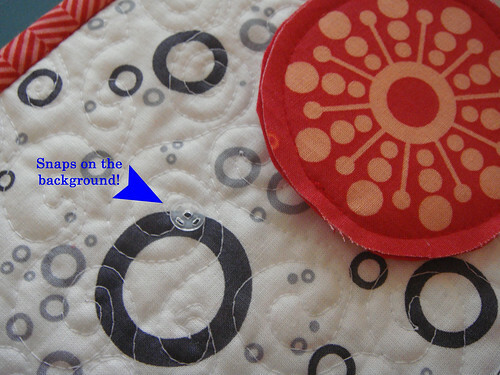 Typical quilter's conundrum huh? Such a great idea. I will have to try to make something similar to this! Thanks for a great start! Hope you guys enjoyed your day out. The gray/red combo is so bold - love it! What a great way to count down to the holidays!! Love your project. This is my favorite project so far! Very cute idea! the gnomes just make me smile. I love this and I think you could use it to count down birthdays, Easter, school holidays etc. Thanks so much for sharing this, it is gorgeous. What a clever project! I love it! Great idea for a cute project!